To see how successful they’ve been just take a stroll down the soup aisle of your conventional mega-supermarket. You’ll see the same two companies dominating the aisle in every supermarket in every state in America – Campbell’s and Progresso. Once, I was curious and so I walked into the local Stop n Shop where I live and I counted every type of soup from both companies. I counted 94 varieties of Campbell’s and 70 varieties of Progresso. That’s over 160 from just two companies! Combined they counted for over 95% of the soup choices. A significant portion of these were creamy vegetable soup varieties. Tomato, cream of mushroom, cream of broccoli, cream of potato and many more are among the bestsellers for these companies. Creamy vegetable soup sells well because they’re familiar to us. Before the age of canned soups, they were some of the simplest soups to prepare at home. Mothers and grandmothers have been making them for centuries. It doesn’t get much easier than simmering some vegetables, adding some broth and pureeing it all together. That is, of course, with the exception of canned soup. Yes, opening a can and heating it may be simple but canned soups, especially those from Campbell’s and Progresso, are full of genetically modified industrial oils (canola, cottonseed, corn, soybean) and all sorts of artificial and, of course, “natural” flavors (a food industry labeling loophole that really means chemical flavoring). 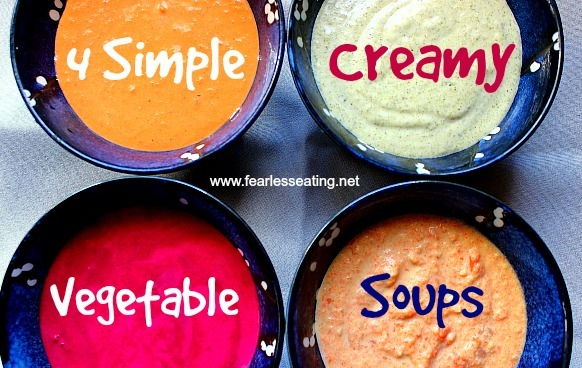 What follows is 4 creamy vegetable soup recipes from my book, Fearless Broths and Soups: Ditch the Boxes and Cans with 60 Simple Recipes for Real People on Real Budgets, and all of the recipes are broken down into 3 simple steps. If you’re new to making homemade soups, these recipes are a great place to start. Yes, it may be a little more time-intensive than opening up a can it’s well worth it for your health and your family’s health. And your grandmother would be very proud too. Step 1. Saute garlic and onion in butter about 5 minutes. Add tomato paste and cook another minute or two. Add flour, stir and cook another minute or two, careful not to burn. Step 2. Add chicken broth, tomatoes, thyme and bay leaves, bring to a boil and simmer about 10-15 minutes. Remove thyme sprigs and bay leaves and puree with immersion blender or regular blender. Step 3. Add cream, mix well and season to taste with sugar and salt and pepper. Top with as much fresh basil leaves as you desire. 1. Adjust creaminess as desired by adding slightly more or less broth, cream and/or flour. 2. Additional accompaniments – sour cream, crème fraiche, bacon, parsley, chives. Step 1. Saute onion in butter about 5 minutes, add flour and whisk for about a minute. Add cream and whisk until smooth. Step 2. Add chicken broth and broccoli and simmer until broccoli is tender about 10 -15 minutes. Puree with an immersion blender or regular blender. Step 3. Add cheese, mix well and salt and pepper, to taste. 1. Start slow and stir in the cheese in small amounts until you get your desired cheesiness. I often will use more than 12 ounces! Who doesn’t love MORE cheese? 2. Add less broth and a little more flour for a slightly thicker consistency. 3. Top with crispy bacon, chopped into pieces. HIGHLY RECOMMENDED! Step 1. Saute onions, garlic and ginger in olive oil until softened, about five minutes. Add cinnamon and saute another minute or two. Add carrots and apples and saute another few minutes. Step 2. Add chicken broth, bring to a boil and reduce heat and simmer 15 – 20 minutes until carrots are cooked. Puree with an immersion blender or regular blender. Step 3. Add heavy cream, mix well and season to taste with salt and pepper. Add more cinnamon if desired. Step 1. Saute garlic and onion in olive oil about five minutes. Step 2. Add chicken broth, beets and optional potatoes and celery, bring to a boil and reduce heat and simmer about 40-50 minutes until beets are tender. Puree with immersion blender or regular blender. Step 3. Add heavy cream and mix well. Season to taste with salt and pepper and add sour cream and chives, to taste. 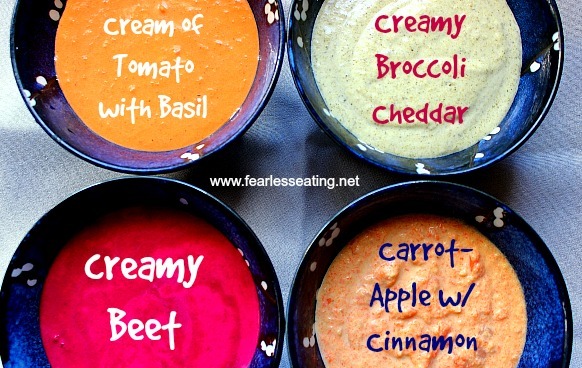 Get More Creamy Vegetable Soup Recipes! My book, Fearless Broths and Soups, has an entire chapter devoted to creamy vegetable soup recipes as well as recipes for other simple soups like Asian noodle soups, simple meatball and sausage soups, seafood soups and chowders, and simple soups for breakfast. All of the recipes emphasize simplicity. They’re geared to all you stressed out moms and dads, workaholics and non-cooks trying to figure out how to eat well with limited funds and time. I’m also currently working on my next book will be about Thai broths and soups. I traveled to Thailand this past year and was inspired by the wide variety of simple, broth-based soups that are fairly unknown to most westerners. These soups are ideal for not just adding variety to your kitchen repertoire but for their gut-healing powers as well. I’ll be previewing many of the recipes in the coming weeks including many gut healing tips too. Just sign up for my newsletter below and you won’t miss a post!